It’s as easy as grabbing your phone, scrolling through your contact list and sending us the information of your friend that would appreciate a custom made suit. If your friend sets up an appointment with us and orders his first bespoke suit, we’ll thank you with a $50 gift certificate to use towards your own bespoke garment! How easy is that?! 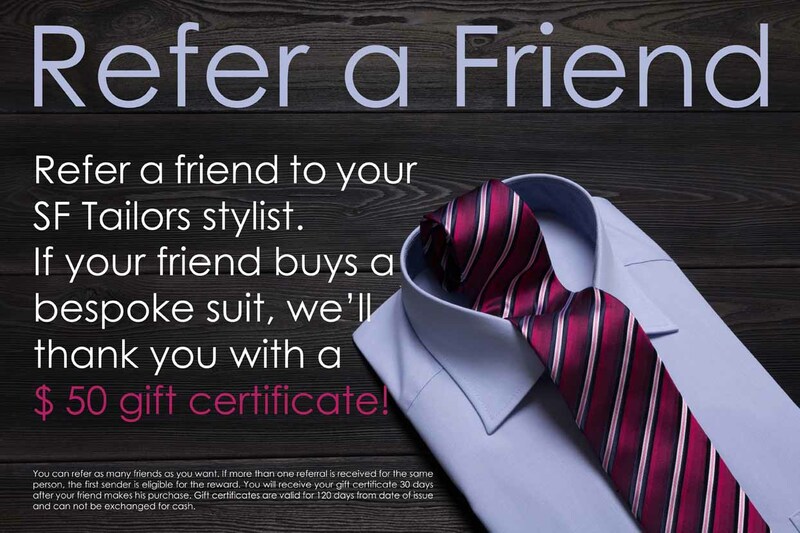 You can even refer multiple friends and save up your gift certificates to get your own suit or shirt completely free of charge! You can refer as many friends as you want. So what are you waiting for? Start building your new wardrobe… for free! Use this form to send us the information of your friend(s). Don’t hold back: the more friends you send us, the better! If more than one referral is received for the same person, the first sender is eligible for the reward. You will receive your coupon for the free shirt 30 days after your friend makes his purchase. The coupon is valid for 90 days and can not be exchanged for cash. ← Your Stylist is Here to Help you!